But how is technology changing the education industry on a macro scale? There are several shifts occurring that could have major implications for publishers. We'll shed light on three EdTech trends that will shake up the education industry and explain why publishers should pay attention to them. One of the greatest things about the internet is that it has given access to educational resources across the world. From YouTube to blog posts, almost anyone in the world can learn almost anything they want, given that they have access to democratic sites. This idea of accessible resources has seeped into higher education, and the number of courses that are available online grows each day. An increasing number of universities are recording an entire semester’s worth of lectures and sharing them for free on the internet. This new format, known as MOOCs (“massive open online courses”), are often completely free for people to access, and learners can choose to pay a small fee for course materials or a certificate of completion. The rise of online courses is also happening in the private sector, notably for professional courses. More people are creating for-profit courses online in many subjects, from life management to graphic design, and building an online community out of students. With the price of a university degree rising, it’s easy to understand why consumers would prefer the price of cheaper or more affordable online courses. These new course designs enable more people to advance their education in a field of their choosing without having to take on student loan debt. As the number of online courses grows, an obvious hurdle for these courses to overcome is their authenticity. In a world where anyone can create an online course, how do employers verify the course’s quality? Traditionally, this question was answered through accreditation and the prestige of a university degree. A Bachelor’s degree in Economics from the Leiden University would ensure that a student had a certain level of understanding of economics. Employers could even ask for transcripts to see which courses a student took, and the grades they received. In a modern educational system, the prestige behind a university degree and transcript might fall aside to a more practical format: a digital “transcript” secured by blockchain. Blockchain is a tamper-proof way for individuals to share their educational history safely, quickly, and at a low cost. It could perform the same function as a transcript, showing courses that a student has taken and their individual performance, but would remove the need for a middleman completely. An increasing number of EdTech startups are emerging to take over some of the traditional aspects of the educational industry. The traditional stakeholders in the industry have been slow to adopt new technologies, and newer companies have devised faster and easier ways to do many of the same jobs, both in the administration to the creation of educational materials. From companies like Keystone Academic Solutions, which handles student recruitment for universities to language applications like Duolingo, which provide teachers with in-classroom materials and assistance, the EdTech startup culture is booming. The education market is ripe for these startups since the adoption of technology has lagged. These new companies are set to outpace traditional educational institutions in the coming years, including publishers. The multitude of ways that technology is used in education signals that the entire ecosystem is changing. This legacy-driven industry is having a hard time adapting with technology, and new advancements are stepping in to take advantage of the opportunity. Publishers are not immune to these changes. Many publishers risk falling behind the innovation curve if they don’t adapt in time. Much MOOCs might replace a university education, blockchain might replace accreditation, and startups might take over key functions in a university, technology will undoubtedly reach publishing with full gusto. The best way to stay ahead of the curve is to adopt productivity-enhancing technologies that help ready your business for the future. At EDIA, we have a product called 360AI that’s designed to do exactly that. By using automation to meta-tag your organization’s educational content, your content library becomes much more agile and useful. Don’t let startups pass you: learn more about how technology is changing education today. 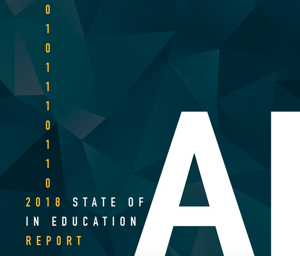 With EDIA’s 2018 State of AI in Education report, you’ll get the latest update about how AI is affecting our industry. Packed with insights from market research, the report gives you everything you need to know about EdTech in 2018. Click the button below get your copy today. Next ARE WE ENTERING A ‘GOLD RUSH’ WITH ARTIFICIAL INTELLIGENCE IN PUBLISHING?